Oil on canvas, 39,5 x 22 cm. 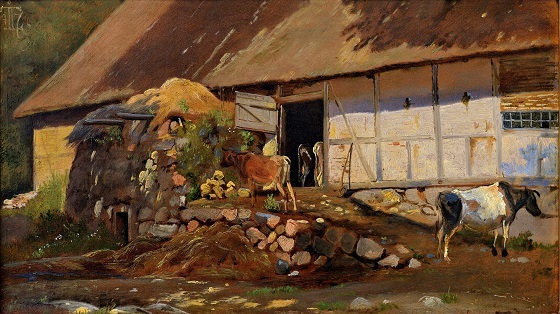 In this study of cows, Lundbye has most unusually elected to let the back of a stable form the overarching framework for the scene. In so doing, the artist has depicted another side of the cows’ daily life which was traditionally not considered very picturesque or worth painting. Lundbye has even added a dunghill in the very middle of the composition, thereby placing an otherwise insignificant and off-putting element at the centre of attention. The masterful brush strokes and expressive style, however, lend both the dunghill and the rest of the scene a fresh and picturesque quality.